Milky Bear is back and this time he's blasting off to rescue his little green friends. He's far from home and doesn't have his trusty snowballs, but that won't stop Milky Bear from saving the day. 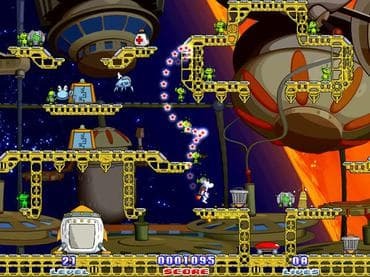 Jump, dodge and kick your way through 80 levels of exciting arcade action, avoiding mechanical foes and leading Milky Bear's friends to safety. Download free full version pc game and join Milky Bear for his latest adventure today! If you have questions about Milky Bear: Rescue Rocket game, please contact us using this form.